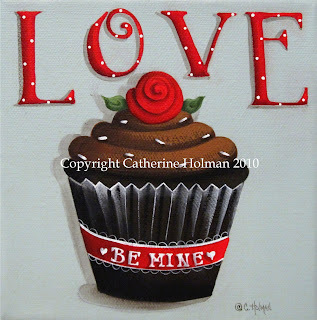 Catherine Holman Folk Art: Valentine's Day Giveaway! Maura of "Lilac Lane Cottage" is the winner of my Valentine print giveaway. Stop by her blog to congratulate her! Her posts will make you dream of the heavenly lilac scent that arrives each spring! Maura, please email me with your address and I'll get this in the mail. Congrats to the lucky winner! Happy Valentine's Day, Cathie! Hi Catherine, Happy Valentines day to you. I love this sweet piece, good enough to eat!!! Lucky lady that won. Congrats to Maura! What a lovely win this one was.